From Machrihanish village it is a little bit of a slog to get to the entrance of Killypole forest. We cheat by driving through the village follow the road past the Golf Club and Ugadale Hotel. 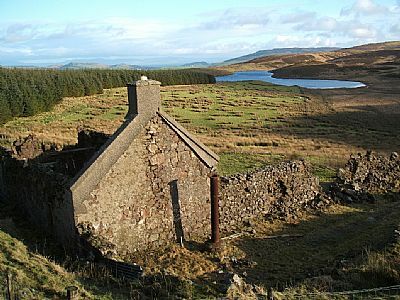 The road quickly becomes single track and is the route of the Kintyre Way. There is a small signpost to the Bird Observatory to the right but carry straight on up the hill until there is a significant right hand bend in the road. The entrance is to the left and there is a style beside the forest gate. There is sufficient parking for a few cars without blocking the way for any forest traffic. Our favourite route is to follow the forest track to the left and carry on till it comes to an abrupt end, there is a small path and about 100yds or so there is a small break in the conifer trees to the right which leads down to a small burn and an obvious crossing point in the fence. 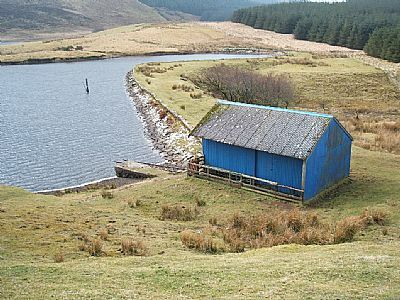 After crossing the fence proceed up the hill and eventually a path will be found which leads to Killypole Loch and a blue boating shed. The path ventures off to the right and meanders up to a derelict cottage which had a roof on when we first came to Machrihanish. It has long since collapsed. Go past the sheep pens and you will see crossing points in the fence. The views from the cottage are dramatic with views across to Campbeltown in the foreground and Arran, Ailsa Craig and the Ayrshire coast line. It is even more dramatic in the winter when the Goatfell ridge on Arran is snow capped. From the derelict cottage the forest road takes you back to the entrance. 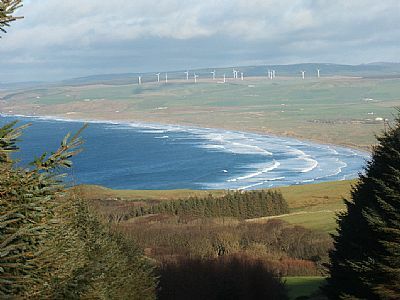 On route back home there are views to Ireland, then Islay, Jura and a wonderful panoramic view of Machrihanish Bay. As you get closer to the entrance you will pass by the Argyll FM transmitter on the right. Walking back to village is very pleasant with great views.